The January economic data is starting to trickle in, and so far the signals are encouraging. Well, mostly encouraging. There’s a question about the year-over-year change in unadjusted jobless claims, which are posting an increase for the second week in a row. But the seasonally adjusted numbers are still trending positive, and so the warning in the raw data may be a statistical quirk rather than a genuine warning. Supporting the case for optimism for the first month of the new year so far is today’s strong gain in the Markit US Manufacturing Purchasing Managers Index (PMI) for January. It’s still far too early to say anything close to definitive about January, but let’s bide our time anyway with a look at what we’ve seen so far. Let’s start with today’s jobless claims data. New filings for unemployment benefits fell again last week, dropping to 330,000 on a seasonally adjusted basis—a five-year low. As the chart below shows, last week’s total was another convincing strike downward into new territory in the post-Great Recession period. So far, so good. But there’s a puzzling lack of follow-through in the year-over-year change in the unadjusted data. For the second week in a row, the raw claims data has increased over its year-earlier level. On its face, this is troubling. But a closer look at the numbers suggests this is a temporary glitch, which isn’t unprecedented for a data series that’s known for lots of volatility in the short run. Supporting the case for seeing the glass half full: the seasonally adjusted data continues to trend lower, both on a weekly basis and on a year-over-year basis. There’s also quite a bit of encouraging news in the December economic reports, and today’s January data point from Markit on the PMI front extends the upbeat numbers into January for the moment. 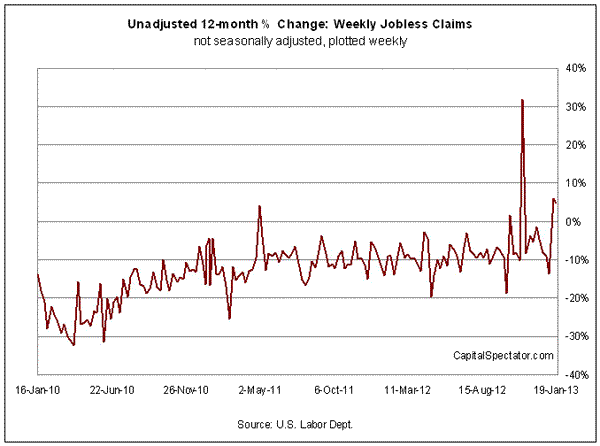 So what should we make of the annual rise in the unadjusted weekly claims data? For now, it looks like a statistical digression. It’s not the first time that the usually reliable year-over-year comparison fell off the wagon. It’ll be a different story, of course, if the annual increases persist. We’ll know soon enough. Indeed, next week brings more January numbers, including the all-important payrolls data and the ISM Manufacturing Index. I remain cautiously optimistic that the positive trend we’ve seen in a wide array of reports recently will roll on. 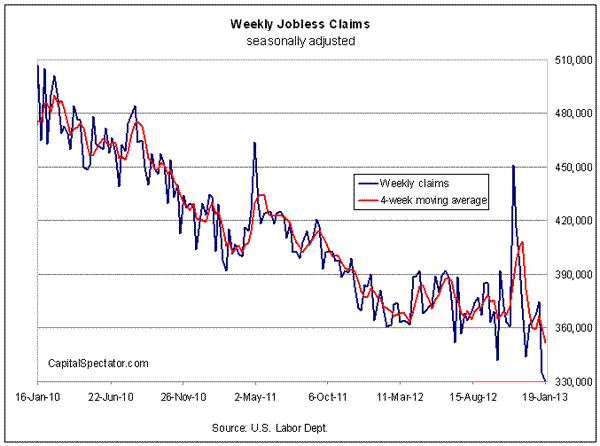 But there’s always a statistical fly in the ointment, and it happens to be unadjusted jobless claims this time around. But one or two pests at a picnic isn’t a reason to pack up.